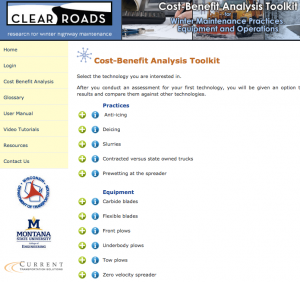 To help winter highway maintenance managers justify the costs of new materials and equipment in the face of frequent budget cuts, Clear Roads funded the Cost-Benefit Analysis Toolkit – Phase I research project. Clear Roads members were pleased with the resulting toolkit and decided to expand and enhance it further. This Phase II research project enhanced the Cost-Benefit Analysis Toolkit developed in Phase I, addressing issues and expanding its functionality to include additional materials, equipment and methods. Ability to run on more versions of Internet browsers. Reporting in additional formats (such as Microsoft Word) for easier manipulation for presentation. Ability to save multiple scenarios and revisit them. Options to analyze more winter maintenance materials, equipment and methods. See the article in the “Winter Maintenance Supplement” of Roads and Bridges magazine (June 2013 issue).